If you’re planning to hike in the Marlborough Sounds, this local boat service ensures easy round-trip transport from Picton to the Queen Charlotte Track. Choose from three self-guided walks of varying length and challenge. Hop on the boat in the morning to the start of your route at Ship Cove, Endeavor Inlet or Torea Bay, then be picked up at the other end of your hike in the late afternoon. Enjoy complimentary coffee and tea on board as you take in the natural beauty of Queen Charlotte Sound. This round-trip boat service from Picton makes a day hike on the Queen Charlotte Track an easy option for those short on time. The entire 44-mile (70-km) track normally takes a few days complete, but you can explore one of three sections in just one day. This popular tramping route is known for its astounding vistas over Queen Charlotte Sound, situated within the greater Marlborough Sounds. You’ll trek past lush native plants and historic landmarks while on the lookout for birdlife. Leaving Picton in the morning, climb aboard the boat and cruise Ship Cove, Endeavor Inlet or Torea Bay to the starting point of your chosen hike. When you reach the other end, the boat picks you up in the late afternoon for the return trip to Picton, which includes complimentary tea or coffee on board. 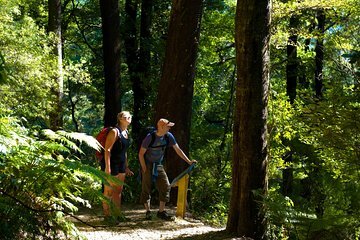 Choose from three options in the Itinerary for your day hike along the Queen Charlotte Track. You can purchase a drink or bite to eat at the lodges at the end of each walk, but it is recommended that you bring your own snacks and drinks to keep you fortified throughout the day. One of the most popular day hikes, the moderately challenging 5-hour walk between Ship Cove and Furneaux Lodge covers 9 miles (14 km). After a scenic boat ride to the start of your walk, take a moment to discover the history of Ship Cove. In 1770, Captain James Cook resupplied his ship here and it became his favorite anchorage in New Zealand. You can browse informative displays about Cook and the Maori; see a monument to Cook and carved sculptures by Maori artisans. Enjoy the pretty beach where you may spot shorebirds such oyster catchers and weka. Then hit the trail, following well-groomed paths through virgin rainforest on a steady climb to the Tawa Pass. Soak up spectacular views of the sound as you walk, including Resolution Bay, Tawa Bay and Endeavour Inlet. Arriving at Furneaux Lodge, have time to relax and perhaps purchase a late lunch or coffee before returning to Picton. One of the easiest sections of the track, the Lodge to Lodge walk begins at Furneaux Lodge and ends at the Punga Cove Resort. After about a 1.5-hour boat ride, arrive at Furneax Lodge. If you like, purchase coffee or brunch at the lodge before setting out on your trek. The trail mostly follows the coastline around Endeavour Inlet, winding through lush native plant life on land that was once farmland and has been allowed to regenerate with native bush. Stop to see the remains of an antimony mine and read the posted information panels about it on-site. Continue along the shore then through native forest with fantastic views right of the Inlet and the larger Queen Charlotte Sound. Expect a relatively easy 3- to 4.5-hour walk covering almost 8 miles (12.7 km) with some up and down. When you arrive at Punga Cove Resort, purchase a well-deserved beverage at the Boat Shed Café before boarding your boat for the return journey to Picton. This route permits you to walk a lot of the track in the shortest amount of time. Expect to walk just under 15 miles (24 km) on a challenging full-day walk that takes about 8 hours, and is well worth the effort. Your day starts when your boat leaves Picton in the morning and drops you off at Torea Bay. Start up the trail to the ridge line and soak in panoramic views of the Queen Charlotte and Kenepuru Sounds as you trek. Follow the path through native forest and pine forest with stunning scenery throughout the day. When you arrive at Punga Cove, reward yourself with the purchase of a drink or a meal at the resort’s bar. Your boat picks you up in the late afternoon to take you back to Picton. Wonderful trip, particularly walk from Ship Cove to Furneaux Lodge. Boat trip great, on time and enjoyable, thank you. Well organised trip with the most amazing views you will ever see. We chose the 15km/9mile tramp. There was a lot of UP some steep in places but it was well worth the effort there was plenty of time and even enough time for a beer or a swim, at Furneax Lodge while you wait to be picked. The boat-ride to and from Ships cove/Furneaux lodge was cool, with the person at the helm providing info on the area and interesting and funny banter. I enjoyed the walk, and although I am not that fit I found it easy enough to do in the time provided. Also, there were a reasonable number of people on the track which was pleasant. The scenery was beautiful! Great walk. A good welcome at Furneaux Lodge who kindly helped me dry out. Great trip with Bruce to and from the walk. Bruce was great and managed for us to see dolphin, a family of Orca whales and a seal! What a bonus!